Depth can be ordered in letter size (12 1/4") or legal size (16 1/4") which allows a net opening for letter sorter of 11 1/4"W x 11 1/4"D or legal sorters of 11 1/4"W x 15 1/4"
Letter or legal size sorters have twenty one shelves with 24 pockets and weighs 110 lbs. (STANDARD) Closed back mail sorters are open on one side of the unit for document distribution and closed on the other side. This is the most common type of mail organizer in the marketplace. (NO EXTRA COST) Open back mail sorters are open on both sides for document distribution. Pocket opening identification can be done on either or both sides of the organizer. 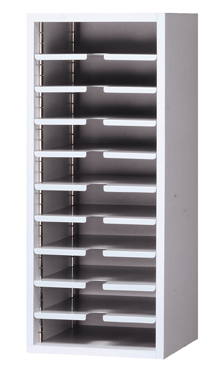 Often, open back mail sorters are recessed into a wall by end users. (+$24.00) Label holders allow the end user to identify each pocket opening. If this option is chosen you will be provided the appropriate amount of transparent plastic label holders with double sided tape and cardboard inserts for personalized marking to designate each pocket opening. (STANDARD) Finishes for sorter shelves are an electrostatic powder coat paint that is endorsed by the EPA. All of the finish selections are priced equally. Color chips are available at the buyer's request at no cost. (STANDARD) The exterior and interior of the mailroom sorter has a laminate finish which provides durability and appearance benefits. A matching PVC tape is applied to the exposed edges to finish off the unit. All laminate finishes are priced equally. Feel free to request color chips at no charge to help you in your color selection. 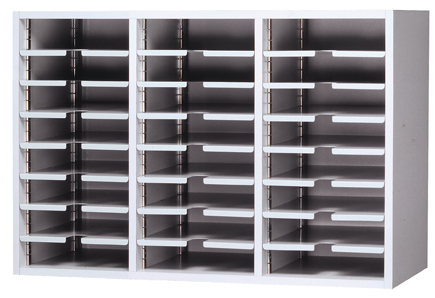 Shop our entire line of mail sorters online now or other commercial building products including apartment mailboxes and more for high-quality products at the best value.